Reverse osmosis (RO): is a separation process that uses pressure to force a solution through a membrane that retains the solute on one side and allows the pure solvent to pass to the other side. More formally, it is the process of forcing a solvent from a region of high solute concentration through a membrane to a region of low solute concentration by applying a pressure in excess of the osmotic pressure. This is the reverse of the normal osmosis process, which is the natural movement of solvent from an area of low solute concentration, through a membrane, to an area of high solute concentration when no external pressure is applied. The membrane here is semi permeable, meaning it allows the passage of solvent but not of solute. This phenomenon is commonly noticed in case of the water falling from the leaves of a tree.The membranes used for reverse osmosis have a dense barrier layer in the polymer matrix where most separation occurs. In most cases the membrane is designed to allow only water to pass through this dense layer while preventing the passage of solutes (such as salt ions). This process requires that a high pressure be exerted on the high concentration side of the membrane, usually 2–17 bar (30–250 psi) for fresh and brackish water, and 40–70 bar (600–1000 psi) for seawater, which has The membranes used for reverse osmosis have a dense barrier layer in the polymer matrix where most separation occurs. In most cases the membrane is designed to allow only water to pass through this dense layer while preventing the passage of solutes (such as salt ions). This process requires that a high pressure be exerted on the high concentration side of the membrane, usually 2–17 bar (30–250 psi) for fresh and brackish water, and 40–70 bar (600–1000 psi) for seawater, which has around 24 bar (350 psi) natural osmotic pressure which must be overcome. A sediment filter to trap particles including rust and calcium carbonate Optionally a second sediment filter with smaller pores. Portable reverse osmosis (RO) water processors are sold for personal water purification in various locations. To work effectively, the water feeding to these units should best be under some pressure (40 psi or greater is the norm). Portable RO water processors can be used by people who live in rural areas without clean water, far away from the city’s water pipes. Rural people filter river or ocean water themselves, as the device is easy to use (Saline water may need special membranes). Some travelers on long boating trips, fishing, island camping, or in countries where the local water supply is polluted or substandard, use RO water processors coupled with one or more UV sterilizers. RO systems are also now extensively used by marine aquarium enthusiasts. In the production of bottled mineral water, the water passes through an RO water processor to remove pollutants and microorganisms. In European countries, though, such processing of Natural Mineral Water (as defined by a European Directive) is not allowed under European law. (In practice, a fraction of the living bacteria can and do pass through RO membranes through minor imperfections, or bypass the membrane entirely through tiny leaks in surrounding seals. Thus, complete RO systems may include additional water treatment stages that use ultraviolet light or ozone to prevent microbiological contamination. )In the water treatment industry there is a chart of types of contaminants, their sizes and which ones pass through the various types of membranes. Membrane pore sizes can vary from 1 to 50,000 angstroms depending on filter type. “Particle filtration” removes particles of 10,000 angstroms or larger. Micro filtration removes particles of 500 angstroms or larger. “Ultra filtration” removes particles of roughly 30 angstroms or larger. “Nanofiltration” removes particles of 10 angstroms or larger. 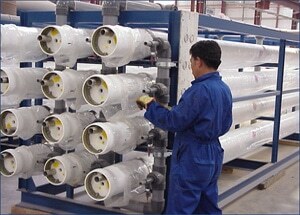 Reverse osmosis is in the final category of membrane filtration, “Hyper filtration”, and removes particles larger than 1 angstrom. Reverse osmosis is similar to the technique used in dialysis, which is used by people with kidney failure. The kidneys filter the blood, removing waste products (e.g. urea) and water, which is then excreted as urine. A dialysis machine mimics the function of the kidneys. The blood passes from the body via a catheter to the dialysis machine, across a filter. Because of its lower mineral content, Reverse Osmosis water is often used in car washes during the final vehicle rinse to prevent water spotting on the vehicle. 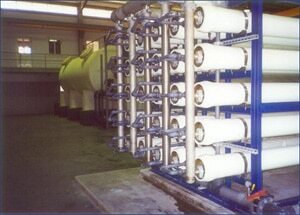 Reverse osmosis water displaces the mineral heavy reclamation water (municipal water). Reverse Osmosis water also enables the car wash operators to reduce the demands on the vehicle drying equipment such as air blowers.